1. 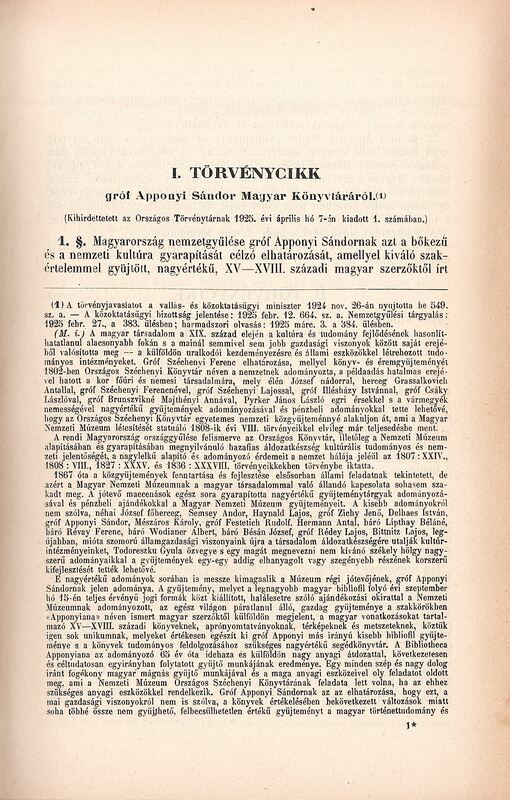 § The National Assembly of Hungary, to express the gratitude of the Hungarian people, codifies Count Sándor Apponyi’s generous decision that he offers his valuable, well-assembled collection of Hungarian and Hungarian related books, small prints, maps, carvings and other, valuable old books, to the Hungarian National Museum after his death. 2. 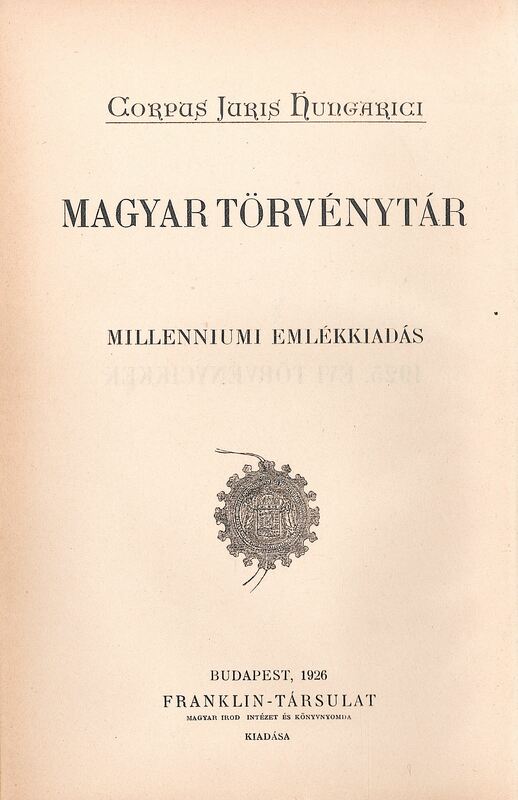 § The Count’s collection shall be kept under his protection in his castle in Poland while he lives, and after his death, it shall be placed in the National Széchényi Library of the Hungarian National Museum, with the name Bibliotheca Hungarica Apponyiana, for eternity, separated from all other collections, worthy of its value, ordered in scientific and aesthetic manners. Nothing can be estranged of the collection. 3. § His Majesty’s Minister of Religion and Public Education shall be tasked with executing this law. The Hungarian society, on a level of culture incomparably lower than today’s, and in no better economical condition, has accomplished by itself what was helped by the rulers and the state in other countries, has founded institutes of science. The decision of Count Ferenc Széchényi to gift his collection of books and coins with the name National Széchényi Library, greatly affected the noble society of his era, led by Palatine József, Prince Antal Grassalkovich, Countess Julianna Széchényi (Ferenc’s wife), Count Lajos Széchényi, Count István Illésházy, Count László Csáky, Countess Anna Brunszvik-Majthényi, János Pyrker, Archbishop of Eger, and the nobles of the counties to donate their collections and money in order to help the National Széchényi Library transform into a universal national collection, which was completed by the founding of the Hungarian National Museum in 1808. The Parliament of Hungary, recognizing the cultural and national significance of this will to found and enrich the Museum and the Library, to express its gratitude, codified the merits of the generous founder and donators. Since 1867, maintenance of public collections is considered a task of the state, but the connection between the Museum and the people has never been broken. A range of patrons have helped the Museum with monetary donations or their collections. Not mentioning the smaller donations, Archduke József, Károly Mészáros, Count Rudolf Festetics, Antal Hermann, Baroness Eugenia Lipthay, Baron Ferenc Révai, Baron Albert Wodianer, Baron József Bésán, Count Lajos Rédey, Lajos Bittnitz, and lately, since the sad state of the economy again makes cultural institutes depend on the society, the widow of Gyula Todoreszku and a Szekely lady (who wishes to protect her anonymity) have helped improve our neglected collections. Among all these generous, valuable donations, that of Count Apponyi is by far the most important. This collection, known as Apponyiana, is unmatched throughout the world, containing several unique books, maps, carvings and small prints. The Apponyiana is the result of 65 years of single-minded, directed collection. A magnate receptive to anything grand and beautiful, with his own work and money, has completed a grandiose task that would have been the duty of the Library had it had the sufficient financial background. His decision to donate this never-again collectible, invaluable collection as a gesture of setting a patriotic example, to the Hungarian nation, keeping the Hungarian historical science and the universal national culture in mind, is comparable to the deeds of the Széchenyi family, raising the spirits of the whole nation after the crisis following the Napoleonic wars, and is worthy of codifying.